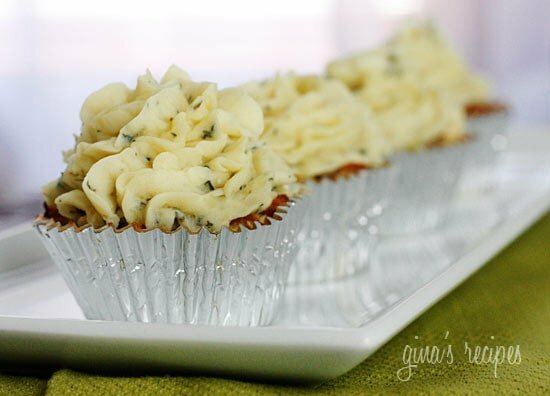 What can be cuter than mini turkey meatloaf cupcakes topped with skinny mashed potato “frosting”. A family friendly meal everyone will love (and no one will guess there are vegetables hiding in the meatloaf)! We love turkey meatloaf, it’s a staple in our home. This is a fun twist on our Classic Turkey Meatloaf Recipe. If you like meatloaf as much as I do, you might also enjoy this Cheese Stuffed Turkey Meatloaf or this Bacon Topped BBQ Turkey Meatloaf. Since my turkey burgers with zucchini are such a smashing success, I decided to make these with shredded zucchini. The mashed potato frosting is basically my skinny garlic mashed potatoes made with fresh thyme which really compliments the meatloaf. I highly recommend using double metal liners, they hold up well with the meat, and if you want to re-heat leftovers, you can simply take the metal part off and pop them in the microwave. Another thing I should mention, I made these in the afternoon because I wanted good light for the shot. For dinner I threw them back into the oven to heat up and the potatoes had beautiful golden edges that actually looked intentional, so this would be a great meal to make ahead and re-heat later for those of you who are pressed for time. If you plan on making them and eating them right away, have the mashed potatoes ready so when the meatloaf is cooked, you can top and eat! I piped them with a pastry bag, but cutting the corner off of a ziplock bag would work, or even using an ice cream scoop. Put the potatoes and garlic in a large pot with salt and enough water to cover; bring to a boil. Cover and reduce heat; simmer for 20 minutes or until potatoes are tender. Drain and return potatoes and garlic to pan. Add sour cream and remaining ingredients. Using a masher or blender, mash until smooth. Line a muffin tin with foil liners. In a large bowl, mix the turkey, zucchini, onion, breadcrumbs, ketchup, egg, and salt. 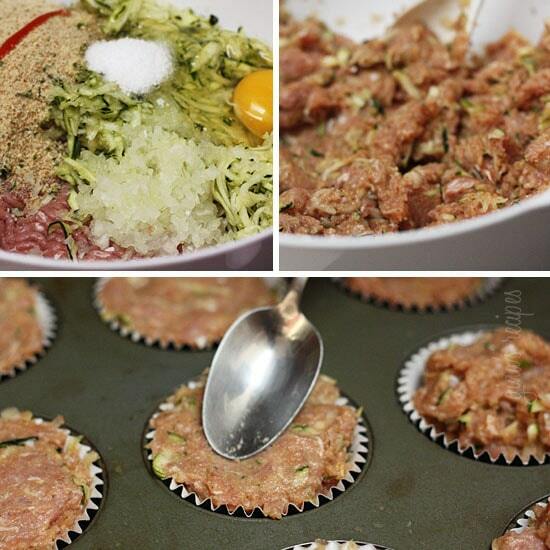 Place meatloaf mixture into muffin tins filling them to the top, making sure they are flat at the top. Bake uncovered for 18-20 minutes or until cooked through. Remove from tins and place onto a baking dish. Pipe the “frosting” onto the meatloaf cupcakes and serve. Can you freeze w mashed potatoes? If so, for how long?? Super excited to enjoy, making tomorrow. These were supermoist, and so good even without the mashed potatoes. I doubled the recipe to freeze enough for a meal on our beach vacation. I have made this twice and just LOVE it. Going to make for Christmas Eve dinner and I need to make 72. If I make them ahead of time, how much time is needed to re-reheat them? My oven space is limited, so I’ll have to cook them ahead of time. This recipe is a staple in my house, I changed the ketchup to Sriracha to get a bit more flavor and kick! Love it! Was considering making mini meatloaf cups in the instant pot with my silicone cupcake liners. Considering making potatoes in the same pot. 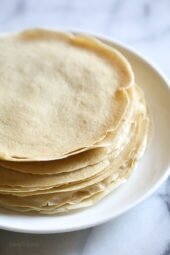 Still new to the instant pot and trying to decipher what is worth making in it and what isn’t. Things that involve boiling water on the stove seem to be easier and less messy in the pot for sure. Any suggestions for cooking times of these mini meatloafs? Does the SP vaLye include the mashed potatoes? If yes what’s SP value without potatoes? Yes it does, sorry I don’t have that information handy. Just made them but I don't think they're done. How do you tell? Can you think of anything I could substitute the ketchup for as I'm allergic to tomatoes? Maybe some kind of proportion of milk and/or a thickener… I'd be curious if you have any ideas. I have used condensed cream-of-mushroom soup instead of ketchup in my meatloaf's for 20 years. I don't care for ketchup & I like the little difference in texture the mushroom soup makes. I am not sure how this changes the "points". I just made these for my boyfriend and I tonight, and they were Sooo good! I forgot to get zucchini, so I used grated carrot instead; still jut as amazing! This was a huge hit with the family! My kids cleaned their plates & asked for more. I forgot to peel the potatoes which of course made for some interesting looking "frosting". 😉 But it still tasted yummy! Definite comfort food! Nice. Thanks for shearing this delicious pancake. I just made these as an april fool's day treat, and they were a huge hit! I've also never had zucchini before, but I didn't even notice it in there! Between this and your chicken rollotini with spinach, I've had more new veggies in the past two days than I have in the past 2 years! I am completely in love with your food, thank you for sharing! These are sooo good! Topped mine with the cauliflower garlic puree for a low carb dinner, and it was a hit at my house! Thank you Gina for all the great recipes! P.S. when, and where might I be able to get your cookbook? Such a great recipe! I sprayed my cupcake pan with olive oil instead of using liners since they were being served at family dinner and not at a party. 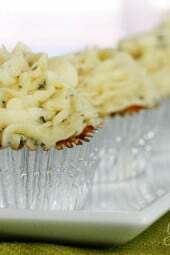 I also used a potato and cauliflower puree instead of the mashed potato frosting recipe to make them even healthier. Was very happy with the end result! About how much potato goes on top of each cupcake? I know this is an older post, but if anyone is egg free and using this recipe I would try applesauce. I was out of eggs one day when I made it and just use a scoop of applesauce. I didn't measure though. It was so tasty that way. Instead of the zucchini I used chopped broccoli slaw. My grandson is 11 yrs old and loves them. It is his favorite recipe to make for us when he stays over. Made these last night, they were delicious! My piping didn't turn out as pretty as the picture, but they were delicious! Does anyone know what the point value would be just for one of the cupcakes, without the frosting? I just subtracted the point value from her mashed potato recipe. Is the calorie count for the meatloaf cupcake alone or does it include the mashed potato frosting? Oh my goodness, I love these. Today was my first time making these, I did use a pork, veal, beef mixture with a tad more seasoning. They were so moist and amazing. Thanks for this great idea, perfect for portion control! I made these for a party last weekend and they were wonderful. This receipe is a keeper! This is going to sound odd, but we are making these for my daughter's 1st birthday. We wanted to celebrate with cupcakes but she HATES cake (not sure she is my daughter…) but LOVES meat. Since she won't eat regular cupcakes, we are going to make these for her to enjoy. Can't wait to see how the pictures turn out with her meatloaf cupcake. haha. I've made these a few times now and my family loves them! I'm not doing ww so I know this would change things for those who are, but I top my meatloaves with a little bbq sauce the last 10 minutes of baking (we do our potatoes on the side to save me the embarrassment of my cupcakes not looking as cute as yours!!). The bbq sauce gets warm and sticky and DELICIOUS! Thank you for posting this recipe. So easy and kid friendly. My kids loved the fact they were having "cupcakes" for dinner. My son tends to be picky about veggies, but he didn't even notice the zucchini in the recipe. The best part was it was a low calorie 30 min meal. Win-Win!! Definitely a repeat recipe. By the way I didn't use liners. I used a little cooking spray. Since there were no liners I think the portions were slightly bigger therefore I ended up with 11 cupcakes instead of 12. All turned out great. We really enjoyed these! Had to bake a touch longer, about 25 minutes or so. But they came out great! And I didn't even have fresh thyme on hand. I used both dried thyme and dried onion and they were still very good. They will absolutely be making it into the regular rotation. Thanks! Delish!! Loved these! And so did my husband and kids. Although, not sure if I followed the recipe correctly, or my cupcake liners were a larger size than normal, but I ran out of mixture by the 8th one and had barely enough "frosting"? Next time I will make more… Looking so much forward to the next time! 😉 So good! Love all your recipes!! Oh, and cooking time… they had to go in for about 45 minutes… I must have taken a wrong turn somewhere. But they were good! Once they were done, I added the frosting and tossed them back in for a few minutes under the broiler to let them crisp…great idea! Roughly how many zucchinis do I need for a cup of shredded? Thanks! 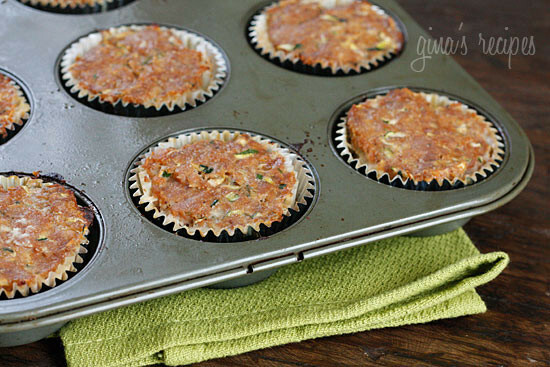 On the meal plan for this week… do you think these would freeze well? I used about 2/3 of one zucchini. I followed this recipe, and added a bit of BBQ sauce to the top of each one and then made them into a shepards pie with canned turkey gravy and corn with mashed potatoes (made with veggie stock), WHAT A HIT!!!! Will definitely make these ones again!! Made these today for lunch! They were really easy to make. Love that they are already portioned out! I'm not a big fan of meatloaf but these are pretty good! Another amazing recipe! I am a stay at home mom to a 9 week old and a 2 year old. I do not enjoy cooking but eating healthy is a priority for us and I was getting tired of eating the same meals over and over. Your website has changed that since I first came on last month! My husband is an amazing cook but works long hours so I do all of the cooking. I have tried about six of your recipes so far and he has loved all of them and is always asking what I am going to try next! Can't say thank you enough! I made these for my whole family tonight, and everyone loved them! The recipe is so similar to my mom's old fashioned beef meatloaf that we grew up with, and the little cupcakes are just so cute! Served them with a side of french green beans and barely escaped with leftovers for tomorrow. Thanks, Gina! 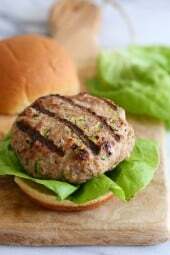 LOVE this recipe… the meat is so yummy and I know I can fool the men into thinking it's beef! what is the best way to reheat them? Making these tonight and can't wait!! We can't get over the texture of meatloaf or meatballs made with breadcrumbs (goes back to the days when my son was anaphylactic to dairy), so I'll be trying them with OATMEAL! Oh – does changing ketchup to condensed tomato soup change anything pointwise? These are great!! Used greek yogurt instead of sour cream,used a little extra milk instead of opening a whole can of chicken broth. Put oven on broiler for a few mins at end of cooking time. Will def.make again. I made these for dinner last night and they were delicious! My husband said to me "I don't want to eat you weight watchers stuff", but after dinner he told me "I would really like to have that again, are there leftover for my lunch tomorrow"! Thank you so much for sharing!!!! I accidently made only 6 cupcakes, how long do you think it will take to cook? One of my family's favorites from ST. Love love love! We garnish with a small amount of cracked sea salt for "sprinkles". Alright Gina, I am madly in love with your site!! We are doing a potluck for Easter this weekend, and was curious if cauliflower "mock" mashed potatoes of some type could be altered into this instead of your lovely carb loaded (but oh so droolworthy)potatoes? Thanks in advanced!! These are delicious! We all loved them, especially my kids! For the person who asked how much meatloaf mixture goes in the cup, for me it was just a bit more than 1/4 cup, I used my measure cup to scoop it into the muffin tin and it worked great, just had a bit left over and I put a little bit more in every cup. For the potatoes I put about a 1/3 to 1/4 cup on top of each. Any thoughts on how to top these with a sweet potato mixture or if that would even taste right together? Just made this, it was excellent, kids loved it! These were our dinner for tonight and were fabulous! 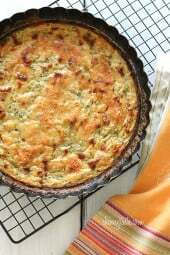 The entire recipe works and my hubby and I loved them. Even my neighbor (who is not a veggie lover) had two of them and was surprised when I told her what was in the meatloaf. Super recipe that will be in my rotation. Thanks, Gina. I made these for dinner tonight – another winner! Your collection of recipes are now part of my weekly menu planning. Have made many dishes and not a bad one in the bunch! Thank you for making it easy for me to cook outside the box! Just finished eating these with roasted broccoli on the side. They were really yummy. I had to cook mine for 30 minutes and I didn't use liners or spray (I forgot) and they popped right out. Of course, mine didn't end up looking as beautiful as yours but they were so very delicious. This was my first recipe from your site but I have now picked 5 out for the week! Thanks! Just found your site a couple of days ago from pinterest. This was the first recipe of yours we tried. My husband, kids and I all devoured these tonight for dinner! Grest, easy-to-follow recipe that will be repeated for years to come! Thanks so much!! Made this with my 4 year old neice tonight.. we topped it wiht pea sprinkles… she gobbled it all up.. at the end i said, you know there was zucchini in there.. she said I love zucchinis!!! I just devoured two of these delicious creations and boy were they good. I cooked them a little bit longer because the loaf is SO MOIST I was worried they weren't done! But they were. This is hands-down the best meatloaf I have ever made and I will be making this again and again and again! Thank you! I made these "cupcakes" and they were fantastic! I served them to my 9 year old granddaughter who loved them and wants me to make them again. So glad I found this website! Also made the sweet potato casserole and that was great, too. I just made these and I omitted the zucchini because I didn't have any. I added red, orange and yellow peppers and they came out fabulous! Served them with frozen Green Giant corn in butter sauce for a delicious 8 point meal! My husband LOVED them too! Is there anything I can substitute for the zuchini. I don't have any in the house and I was hoping to make it tonight? Maybe spinach? Hey! 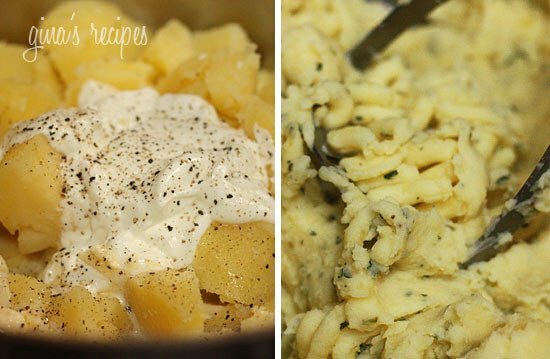 I tried this with mashed cauliflower, and it tastes just as good but shaves off a few points! I made these last night, they were delicious and so pretty on the eyes. I love all your recipes that I've tried so far. Tonight I am making your cilantro lime rice with quesadilla's. Cooking with your detailed instructions and pictures has made me a more confident cook. Thank you for all that you do. Made these a few nights ago and they were wonderful! Moist and flavourful. The paper liners were a bust, very hard to peel them out of the hot turkey but will try with just regular metal liners next time. want to make these, they look delish! can i use ener-g egg replacer in place of the egg? or do you have another recommendation for substitutions? My son is allergic to eggs, whenever I make meatloaf I use a sweet potato patty in place of egg. You can find them in the frozen section of the grocery store. They come in a pack of eight patties. This works great to help bind the meat and no one will know the difference! I made this last night and it was great! I didn't use turkey, I used lean ground beef and russet potatoes instead of Yukon. Even my very picky mini ate it. I served them with broccoli.